Looking for a new weekend adventure in Michigan? Maybe you’re tired of the over crowded, more popular local favorites and are looking for some new scenery and solitude. One lovely fall weekend, my friends and I decided to try out a new trail to see what it had to offer. What did we find on the Shingle Mill Pathway? The Shingle Mill Pathway is in the Pigeon River Country State Forest, not far from Vanderbilt, MI. To get here from Detroit, it’s a straight shot up I-75, exiting for Vanderbilt (Exit 290) and turning on Sturgeon Valley Rd (drive about 10 miles). Its easy access and proximity to main roads make this a perfect winter loop as well. As an added bonus, the forest has the Midwest’s only free range elk herd, so keep your eyes (and ears) open for signs of this beautiful creature along the trail. The pathway is a series of 5 loops of different distances (0.75, 1.25, 6, 10, 11 miles). You could do it as a day hike or a quick weekend overnight. The trail itself is not challenging, as the terrain is mostly flat. This means you can pack some extra wine and good food and hit the trail for a great adventure. Pick up the trail from the back of the Pigeon Bridge campground. There is a trail sign and map for the Shingle Mill Pathway here. H@H Tip: If you drive up late Friday night, Pigeon Bridge Campground or the Pigeon River State Forest Campground (a few miles down the road) are both excellent contenders for camping. The Pigeon River campground is larger and has secluded sites next to the river. The Pigeon Bridge sites are right next to the road making it easy to find your friends if you are all arriving late on Friday night. Both are 15$/night — self pay. You can pick up the trail from either location. The trail winds through forest for the majority of the trek with occasional views of the Pigeon River along the way. There are a couple of very interesting sinkhole lakes along the hike, plus a good viewpoint (by Michigan standards) on the 10 mile loop. I recommend camping on Grass lake if you make this an overnight. The last couple of miles on the trail go through some low-lying areas. Extensive board walks have been constructed to help keep your boots dry. The damp, dark, swampy landscape gives off an eerie feeling. Be sure to allot some time to spend at Section Four Lake. This sinkhole lake has a magical appearance with turquoise, crystal clear water. It’s a perfect spot to sit and enjoy a picnic lunch on a sunny day. The ranger told me camping is not allowed close to this area because the lake is being used for research purposes. A sign near the lake confirmed it. There is a backcountry campsite at the south end of Grass Lake, tucked just beyond the trail post in a clearing of tall pine trees (if you start heading North over a small bridge you have gone too far). Hold out for better sites and keep walking. Follow the trail around the 10 mile loop, passing a great overlook and another small sinkhole lake, until you loop back around to Grass Lake. Look for a small side trail on the left, just past a wooden bridge over a small creek (about a half mile from where you passed Grass Lake Rd for the second time); you will find the most incredible lakeside campsite here on the west side of Grass Lake. If these campsites are full, backtrack until you meet up with Grass Lake Road. 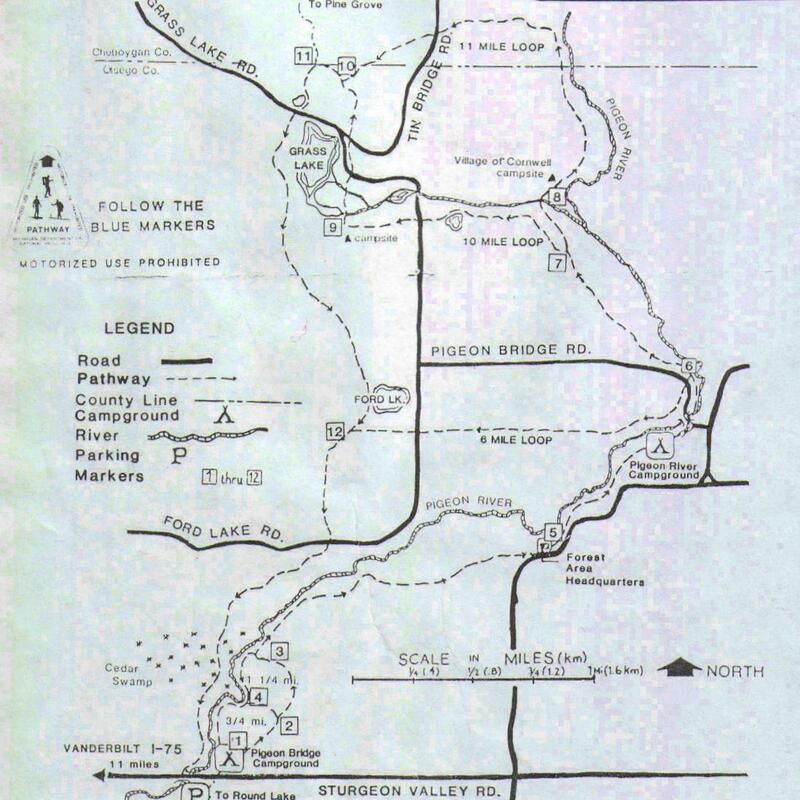 If you’re following along this road, there are several easily accessible sites to use along the northern end of Grass Lake. The Shingle Mill Pathway is the ideal place for a carefree weekend adventure. The trail is easy for beginners to choose their own level of adventure. We saw a few people (mostly hunters; so be sure to wear orange during hunting season) throughout the day along the trail but for the most part it was quiet and secluded, especially at camp during the evening. The fall colors reflecting on the lake were stunning. Grass Lake was the perfect location for a lakeside campfire and star-gazing late into the night. Overall, the weekend was a great success. I’ll put this spot down in the books as a win. Branch out and explore some of Michigan’s other less frequented trails and enjoy a slice of it for yourself. This is next on my list. Thanks for posting!!! Let me know what you think ! It was such a pleasant surprise, I’ll be sure to go back. I’ve got to check this out, plan to try some winter camping this year. Have you ever hiked / camped at Deerfield park in Mt. Pleasant? The trails are very easy, but the views this time of year are beautiful with several bridges and ten semi rustic campsites ( outhouse & hand pump ) overlooking the Chippewa river. I will have to check that out, have never done it. Thanks for sharing that idea. I’m always looking for new spots to try !